Johann Sebastian Bach's Partita No. 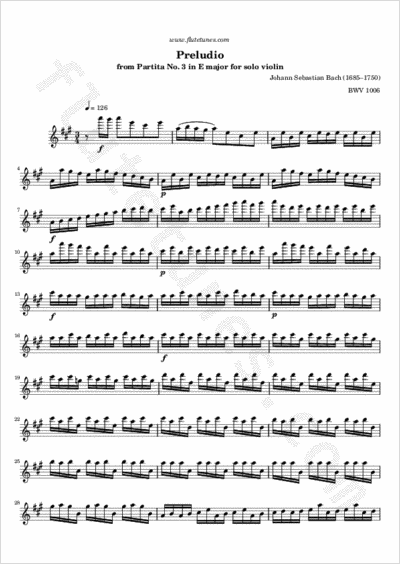 3 for Violin, BWV 1006, was originally written in 1720, but at some point the composer transcribed it for solo lute (a sort of “baroque guitar”), and that version is now known as BWV 1006a. In either version, the first of the seven movements, simply marked “Preludio”, is undoubtedly the most famous. Bach himself also transcribed it for solo organ, oboes, trumpets and strings in the opening sinfonia of the cantata Wir danken dir, Gott, wir danken dir, BWV 29 in D major, and used it as an introduction to the second part of the cantata Herr Gott, Beherrscher aller Dinge, BWV 120a, as well. On the flute, the movement is usually played in the key of A major, and at a very fast pace (just like violinists do). Thanks to Benita for suggesting this piece!